For Matthew Blundell and Sarah Jarrett, their love story was down to fate - because they might never have actually met. They both decided at the last minute to attend the fresher’s ball at Loughborough University and from that moment on, their lives entwined through their studies and eventually they fell in love. 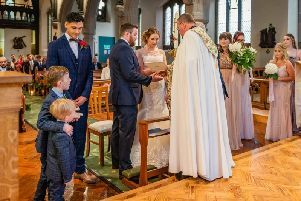 They are both design engineers and tied the knot at St Ambrose Church in Leyland followed by a reception at Farington Lodge. Matthew proposed on Sarah’s 33rd birthday. They picked out the engagement ring together and officially announced their engagement – by WhatsApp a few weeks later. They were both escorted to the church in a beautiful 1950s Bentley. The service was conducted by Father Graham Ashworth and the choir sang John Rutter pieces during the signing of the register. After the confetti throwing, which the couple made themselves from hydranger flower petals, they took a ride together in the Bentley around Leyland and then to Farington Lodge. When they arrived they were fortunate to get chance for a few photographs together outside with the car before our luck with the weather ran out and the heavens opened. Sarah said: “It was a wonderful day and I was so pleased that everything went so smoothly. Although the weather didn’t permit many outdoor photographs it didn’t spoil the day. Time went by so quickly. The church music was fantastic. “The food and service at Farington Lodge was excellent. On reflection, it was great to see everyone enjoying themselves. Matthew added: “The day it self didn’t feel real, almost like a dream. “I was nervous about some small parts of the day – fluffing my lines in church, or the speech and definitely the first dance! “But I needn’t have worried, all were overcome without incident. The couple honeymooned in New York, Florida and the Bahamas.